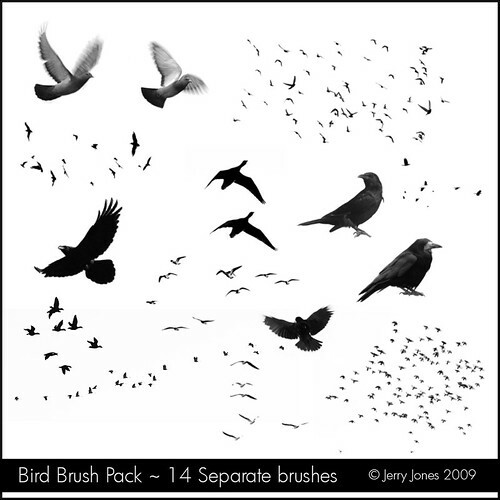 Bird Brush Pack, originally uploaded by SkeletalMess. for download in a zip file below. Caroline, try applying the Paint Shop Pro file extension inplace of the ABR. file. This may work, so give it a try. Thanks kindly Eleanor, I appreciate the kind words and company. Thank you! Your blog post will be advertised on the DigiFree Digital Scrapbooking Freebie search engine today (look for timestamp: 19 Nov [LA 04:32pm, NY 07:32pm] - 20 Nov [UK 12:32am, OZ 11:32am] ). ... and now brushes as well, wow, thanks so much for sharing your creativity so generously. I'm looking forward to using both sets of brushes (especially the birds) and all those superb textures. Thank you so much for this Freebie. I want to let you know that I posted a link to your blog in CBH Digital Scrapbooking Freebies, under the Page 10 post on Nov. 20, 2009. Thanks again. Wonderful brushes! Thank you so much for sharing your talent. Love your site, your art, brushes and textures. Thank you so much for posting the free downloads. I just tried out the bird brushes. Luv em! really like this set of brushes. thanks for sharing them. Jerry, thank you so much for the use of these brushes. Your work is professional quality and I very much appreciate that you share all this. You allow us to explore our own art further. Having so much fun downloading and learning how to use your wonderful brushes.. I think i'm getting the hang of it.. I look at your blog often but just decided to view previous posts. Just found your bird brushes. I have been looking for this. We lost 8 precious students in an EF4 tornado a few years ago (at the school I work for). Many of the tshirts and memorial items show the 8 students flying up to heaven as a dove. I am gong to use the brushes to make a collage to honor them and place in our new school (our old one was completely destroyed--this day 3 years ago). Thank you so much. I love your work, and these brushes really go above and beyond; thank you so much for sharing them! So very cool. Can't wait to play with these. Thanks so much for all the great brushes!!! These brushes are good, lend a real good feel to my rustic stuff, cheers Jerry!! I don't always tell you thank you...so, Thank you! Thank you, Jerry! I have wanted to download these for a while, and now I finally have a program that supports them! So excited! Thank you Jerry your generosity is valued. Jerry, Thank you so much for all of your wonderful work. I can't wait to play. I left a little money in your coffee cup :) I hope it helps! And thanks again. Used your awesome brush here: https://www.flickr.com/photos/danielabonesso/26492189310 thank you so much :) kisses!